Let’s examine, briefly, the effects of creating an invoice that uses multiple currencies in QuickBooks Online; creating a purchase transaction for a foreign vendor works in a similar fashion. Suppose that you have a customer whose base currency is the Canadian dollar and your home currency is the U.S. dollar. So, in this example, “foreign currency” means the Canadian dollar. QBO doesn’t support letting either your employees or contractors record time entries (using either the Weekly Timesheet or the Single Time Activity) associated with a foreign currency customer. First, create the customer: Click Customers → New Customer. 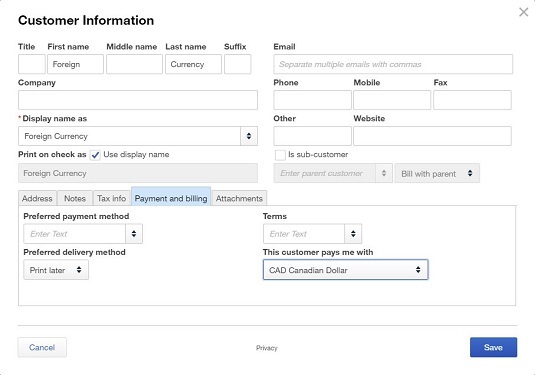 Fill in the window as you usually would with the following addition: Click the Payment and Billing tab. Then open the This Customer Pays Me With list and select the customer’s currency. In this image, the customer, uninspiringly named Foreign Currency, uses the Canadian Dollar. Assigning a foreign currency to a new customer. You’ll find a similar setting available when you create a new vendor. Once you save the customer, if you look at the Customer list page, you’ll see the customer listed, and, in the Currency column, you’ll see the foreign currency. Your home currency customers display your home currency. Next, in the Invoice window, select your “foreign transaction” customer. QBO automatically displays, below the customer’s name, the two currencies (first the foreign currency and then your home currency) associated with the transaction. Once you add products or services to the invoice, the amounts for each line appear in the foreign currency, and totals appear in both currencies. The Balance Due on the transaction appears in the foreign (customer’s) currency so that your customer knows how much to pay. Saving your first sales or purchase document for a customer or vendor using a foreign currency makes QBO automatically establish a foreign currency-related Accounts Receivable and Accounts Payable account. 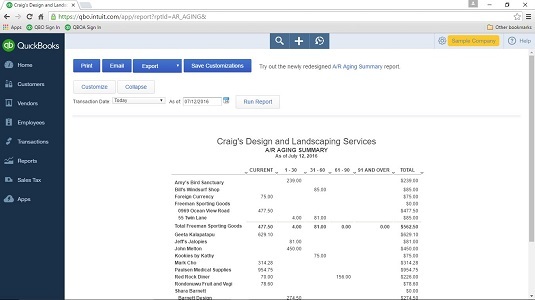 Reports in QBO show values in your home currency. This image shows the A/R Aging Summary; the customer who uses a foreign currency is the third customer on the list. Values on reports appear in your home currency. The Balance Sheet shows the multiple Accounts Receivable accounts QBO uses when you’ve enabled the Multicurrency feature and created a sales transaction using a foreign currency; the values on the report appear in the home currency.